DuPont Recommends The ctemp-USB-80C Single-Use Coin Cell for Dry Ice Shipments - Marathon Products, Inc.
HDMicroSystems ships liquid polyimide precursors to customers around the world. These materials – used to manufacture all portable electronic devices – must be kept cold until use. In addition, customers recognize the importance of having a “transport temperature” log to ensure material will work as expected in their manufacturing processes. Since the international transport process can take up to 5 days, the preferred coolant used by HDM is dry ice. But this puts high demands on the temperature recorder: not only must it comply with new, increasingly stringent lithium battery IATA regulations but it must continue to operate when exposed (even accidentally) to very low temperatures. Marathon has developed a new c\temp-USB-80C Single-use Coin Cell Temperature Recorder which meets both requirements. 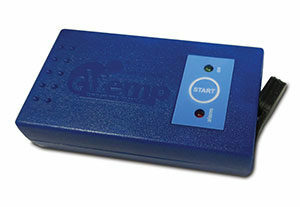 It can be set to collect data for up to 60 days, connects to computers with standard USB mini-to-USB cables, and outputs the entire data set using a sophisticated analysis program available by download directly from the supplier. The extraordinary design works flawlessly with a lithium button battery as its power supply and survives extended periods exposed directly to dry ice (-78C). The entire recorder is compact and fits easily within all of HDM’s shipping containers (ie, small corrugated boxes to large insulated returnable shipping containers). Marathon quickly produced the prototypes we requested and has reliably filled orders up to 1000 units. Consistency and quality of these USB-80C recorders have been critical to customer confidence in our controlled-environment international (and domestic) shipments. Principal Engineer working in support of HDM’s Quality Assurance and Supply Chain functions.